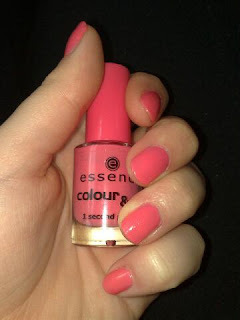 NOTD:Essence VIP Appeal - Cherry Colors - Cosmetics Heaven! Yesterday or the day before my sister sent me a picture of this pretty baby on her nails (yah we do that - send pictures of nail polishes). She said something like 'it would be prefect for your blog', or at least I understood it that way. So here it is! I had it on my nails for a day too, it was really nice! The application was kind of really dense, it dried itself quickly (during apply! so you have to be really fast) but otherwise it was cool! I liked that it was actually dry after some short minutes. I know that lots of people don't like these Color & Go because of the application problems, but if you can work your way quickly, then it's just perfect for you! It can be compared to Essie Status Symbol, but status symbol is a tad darker, but still it's really pretty! What do you think? Do you like the color?